Denis Matsuev has enjoyed a stellar career since his triumphant victory in the 11th International Tchaikovsky Competition in Moscow and is now one of the most sought-after musicians of his generation. His performances in the most prestigious concert halls of the world are always an unfailing success and he appears regularly with world-famous orchestras such as the Chicago Symphony Orchestra, the Pittsburgh, the London Symphony Orchestra, NY Philharmonic, Philadelphia and LA philharmonic, Concertgebouw, Berliner Philharmoniker, the Bavarian Radio Symphony Orchestra, Leipzig Gewandhaus Orchestra, the BBC Symphony Orchestra and the Orchestra of the Mariinsky Theatre. He has a successful creative partnership with the world’s most prominent conductors including V. Gergiev, M. Jansons, Myung-Whun Chung, Z. Mehta, and Y. Temirkanov. 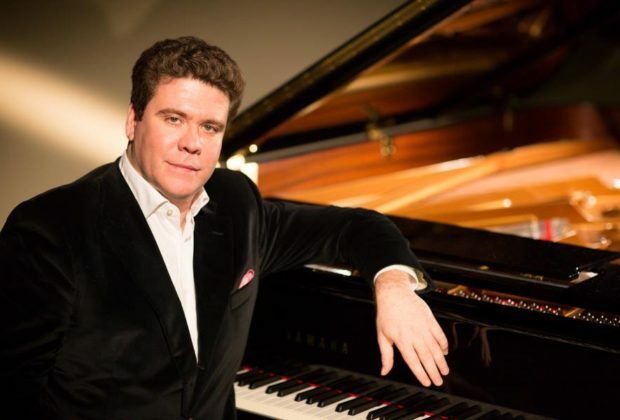 Denis Matsuev continues his artistic involvement with the Serge Rachmaninoff Foundation established by Alexander Rachmaninoff, the grandson of the composer. It was Matsuev who was chosen to present the great composer’s unpublished works, recorded at the composer’s grand piano. For many years Denis Matsuev has led numerous musical festivals and educational projects which have added to his role as a prominent public figure: “Stars on Baikal”, “Crescendo” festival, Annecy Music Festival, “Astana Piano Passion” and “Grand Piano Competition” in Moscow. Denis Matsuev is the president of New Names Charitable Foundation, and artistic director of the Serge Rachmaninoff Foundation. He is a laureate of prestigious “Shostakovich’s Prize”. He also is a “People’s Artist of Russia”, a member of The Presidential Council for Culture and the head of The Public Council under The Ministry of Culture of the Russian Federation. Most recently, he was viewed by millions of spectators around the globe while performing excerpts from Rachmaninoff’s second piano concerto at the closing ceremony of the Sochi Olympic Games. In April 2014, UNESCO designated Denis Matsuev as a UNESCO Goodwill Ambassador. In 2016 Denis Matsuev was announced as 2018 FIFA World Cup Russia™ ambassador. In 2017 Denis Matsuev was awarded with State Order of Honour and got the Prize of the Government of the Russian Federation for his festival “Stars on the Baikal”. This new season for Denis Matsuev includes concerts with La Scala orchestra and maestro Ricardo Chailly, with Bavarian Radio orchestra and Mariss Jansons, with Chamber orchestra “Vienna-Berlin”, with London Symphony orchestra and Gianandrea Noseda, with orchestras of Vienna Philharmoniker, Munich Philharmonic and Mariinsky Theatre and Valery Gergiev, with Israel Philharmonic orchestra and Zubin Mehta, with Berlin Konzerthaus orchestra and Thomas Sanderling, with Vienna Symphony orchestra and Alain Altinoglu, with St.Petersburg Philharmonic orchestra and Yuri Temirkanov, and more. Denis Matsuev’s recitals will take place in Carnegie Hall (New York), Victoria Hall (Geneva), Konzerthaus (Vienna), Pergola Theatre (Florence), G. Verdi Conservatory (Turin), Tonhalle (Zurich), Philharmony (Berlin), Concertgebouw (Amsterdam), Theatre des Champs-Elysees (Paris), Tivoli (Copenhagen) and Elbphilharmonie (Hamburg). This season Denis Matsuev was announced by Staatskapelle orchestra Dresden (conductor – Christian Thielemann) the Capel-Virtuos of the Staatskapelle Dresden and will take part in concerts and tours of the orchestra. To the 145th anniversary of S. Rachmaninoff Denis Matsuev prepared the cycle of all Rachmaninoff’s piano concertos and is ready to perform this cycle during his concerts all over the world. In 2018 Denis Matsuev was announced the Ambassador of FIFA World Cup Russia Denis and organized the unique concert at the Red Square in Moscow on 13th of June.